My wife and I are from the suburbs of Philadelphia. My daughter Kristin had open heart surgery last Thursday. 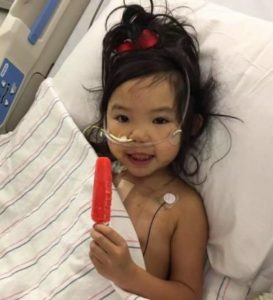 She received a bi-ventricular repair done at Boston Children’s Hospital. She is 5 years old and was adopted from China in July 2015. Our daughter is a complex little girl and the surgery went quite well. They were able to double her blood flow and really help her. While signs are positive, 12 hours after surgery her stats dropped quickly. She has developed some respiratory infections and it’s been a slow process. My wife and I have both been her in Boston the entire time since surgery. Because of the delays I am concerned for my wife as the only caretaker as I am scheduled to fly back to Philadelphia on Monday and begin work. Given we still have a long road ahead of us I was hoping to try to get back to Boston to relieve my wife for a little during weekends and maybe a few extended days. With this being said I was wondering if your organization can help me with flights from Philadelphia to Boston and back home again?